The main purpose of this report is to find out the customer service satisfaction level toward the products and services provided by Mutual Trust Bank, Dhanmondi Branch. In this report briefly discuss on the product Priority banking and find out the satisfaction level of priority customer service of the bank. Also find out the factors on which the priority customers service satisfaction level depends. Finally identify problems and limitations of priority banking and suggest ways of improving the service standard and satisfaction level of the customers. Priority banking is a personal banking of a very niche segment of Mutual Trust Bank, which is mainly catered to offer to the elite class of the society who wants special care and treatment. Priority Banking was first launched in the year 1999, with only one center in Bangladesh. The center was located in Dhanmondi. After the acquisition of ANZ Grind lays Bank in 2001, ANZ Premium Banking Centers also converted to Priority Banking. Initially three-priority centers started operation in 2001 located in Gulshan, Dhanmondi, and Nasirabad, Chittagong. In the year 2003, another center opened in Uttara. This part of Mutual Trust Bank is catered to the very niche segment of the bank. It offers wide range of exclusive services and privileges to its highly valued customers. The main theme of priority banking is providing customers with dedicated relationship managers who will guide the customers and provide information and assistance in this kind of banking. The main competitor of SCB`s Priority banking is the premier banking of HSBC bank. This report attempts to comprehensively describe the concept of priority banking introduced in Bangladesh by Mutual Trust Bank. It focused on the products and services that are offered by this kind of banking, SWOT analysis and the Porters Five Model and. Its main objective is to give a thorough understanding of what priority banking is, how it works, what type of products and services it offers, its strengths and weakness, and its potentials in the coming years. Finally the study of” Priority Banking” identified some problems and limitations of Priority Banking Service and provided a set of recommendation to overcome the identified problems. It is believed that priority banking will lessen time consumption for banking services and elegantly priority suits will be provided for the customers as part of the relaxed banking system by priority banking. It is strongly believed that Priority Banking will make banking simple and easier for its customers. To discuss the product Priority banking. To find out the satisfaction level of priority customers of SCB and different queries regarding products and services. To find out the factors on which the priority customers’ satisfaction level depends. To identify problems and limitations of priority banking. To suggest ways of improving the service standard and satisfaction level of the customers. With its unique position as an international bank with strong franchise, Standard Chartered combines an in-depth knowledge of local markets with global product expertise to offer effective financial solutions. The bank capitalises on its onshore presence across Asia, Africa, and the Middle East to offer customers convenient and reliable access to the widest range of currency markets, to date local market information, country-specific global risk management strategies, and customised capital raising and liquidity management solutions. With 150 years of emerging market experience, our in-depth understanding of the local market is unrivaled by most other financial institutions, especially in the currencies of Asia, the Middle East and Africa. We are able to meet the needs of local corporate, multinational companies, development organisations, investment and financial institutions, and central banks around the world. Mutual Trust Bank (SCB) is a multinational bank, which primarily focuses its activities in Asia, Africa, and Middle East. This bank plays an invigorating role in linking the world’s developed economies with emerging markets and provides personal banking, corporate banking, institutional banking, consumer finance, and custodial services. The act of the bank is to provide the most efficient, consistent and up to date services and to be the bank of choice in its principal territories. SCB is a multinational bank and financial services group that is incorporated in the U.K. with a unique international network. It now spans in the developed and emerging economies of the world, after having been in existence for 150 years now. Since liberation, Bangladesh has passed through fragile phases of development in the banking sector. The nationalization of banks in the post liberation period was intended to save the institutions and the interest of the depositors. However, the performance of the public sector management left some negative effects in the economy. Therefore, the authorization of private banks was designed to create competition among the banks. Now, as it has come to the discussion of private banks in Bangladesh, the first and foremost name that comes to the people’s mind is the Mutual Trust Bank. 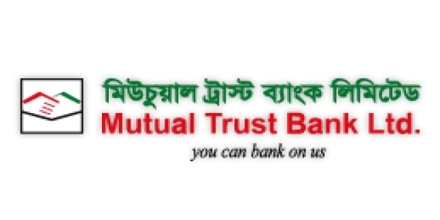 Mutual Trust Bank started its business in Bangladesh in 1948, opening its first branch in the port city of Chittagong. The branch was opened mainly to facilitate the post world war re-establishment and expansion of South and South East Asia. The Bank opened its first branch in Dhaka in 1966 and shifted its headquarter from Chittagong to Dhaka after the birth of the Republic of Bangladesh in 1971. The bank increasingly invested in people, technology and premises as its business grew in relation to the country’s thriving economy. At present, the bank has six offices in Dhaka, Chittagong, and Sylhet, including the country’s only offshore banking unit inside the Dhaka Export Processing Zone at Savar. Extensive knowledge of the market and essential expertise in a wide range of financial services underline their strength to build business opportunities for corporate and institutional clients at home and abroad. Continuous upgrading of technology and control systems has enabled the bank to offer new services, which include unique ATMs and Phone banking. Standard Chartered’s services in Bangladesh range from Personal & Corporate Banking to Institutional Banking, Treasury, and Custodial Services. Standard Chartered offers premium retail banking services to individual customers with a large variety of deposit and loan products. SCB`s Consumer Banking division continuously meets the challenge of developing new products and services to match the specific requirements of its customers. In Bangladesh Standard Chartered offers 24 hour banking services through its Money link ATM network and Call Centre. To enhance customer convenience, Standard Chartered has pioneered off-site Money link ATMs in Dhaka and Chittagong. Their aim is to offer excellent service on 24-hour basis. Standard Chartered is highly reputable in providing flexible and innovative financial services solution. Their expertise is in corporate and institutional banking includes cash management, trade finance and custodial service, consumer banking and treasury operations. They adopt a proactive approach in tailoring customized package to meet their customer’s ever-changing needs. They apply state-of-the-art technology to automate their daily operations and electronic delivery system has been put in place to ensure that transactions are handled swiftly and efficiently. Their dedicated Customer Service Centers are staffed with experienced products specialist to ensure that all their customers are well served. At Standard Chartered, our success is built on teamwork, partnership and the diversity of our people. At the heart of our values lie diversity and inclusion. They are a fundamental part of our culture, and constitute a long-term priority in our aim to become the world’s best international bank. Today we employ over 65,000 people, representing more than 100 nationalities, and you’ll find more than 50 nationalities among our 500 most senior leaders. We believe this diversity helps to fuel creativity and innovation, supporting the development of exciting new products and services for our customers worldwide. Mutual Trust Bank has a full range of financial, foreign exchange, and risk management solutions to meet the needs of clients across the world. Mutual Trust Bank is the first bank in the country to offer automated 24-hour Phone banking service. Our phone banking services include balance enquiry, fund transfer, change of TIN, chequebook request, statement request, foreign currency exchange rate etc., which are available through telephones from the comfort of home, office, or car. Other services available during the working hours include account opening information, remittance query, stop payment instruction, request for draft, renewal of fixed deposit, change of address etc. Phonelink service is offered to all customers free of charge. (4) iBanking:-Mutual Trust Bank’s online banking service. iBanking offers you the convenience of managing and controlling your banking and finances – whenever you want to, wherever it’s needed. iBanking is convenient, simple and secure. To enjoy this facility, you will have to be a customer of Mutual Trust Bank, Bangladesh. Your existing relationship with us can be in the form of an account or a credit card. Mutual Trust Bank’s iBanking facility is simple and secure…. And it is absolutely FREE of charge! With iBanking, you can access any of the basic banking services you require, 24 hours a day, 7 days a week, 365 days a year. iBanking offers the following range of online services. which makes your banking accessible anytime and from anywhere. View your account information, download and print your account statement, request a chequebook, request an account statement by mail and ascertain the status of cheques you have issued. Transfer funds between your own accounts. You can also set-up standing orders to make the fund transfer process simpler and save time. Make your credit card payments from your Mutual Trust Bank account. With iBanking you can view your complete Credit Card details. You can view your Credit Card statement, determine the minimum amount due, request for a credit limit increase and even make an online card payment. Change your password as and when you want to. Standard Chartered offers premium retail banking services to individual customers with a large variety of deposit and loan products. Its Consumer Banking business continuously meets the challenges of developing new products and services to match the specific requirements of customers. Priority Banking – a privileged service offered to the selected customers. The Mutual Trust Bank promises its high valued customers services that are personal, professional, privileged, private and profitable. Offers wide range of exclusive services and privileges. Aims to bring Experience and Expertise. Provides unique ‘Plan, Grow and protect’ methodology to the Customers for maximizing their financial growth. Valued priority customer given exclusive personal attention. Ensuring the kind of facility and services that the valued priority customers deserve. Elegantly furnished Priority Banking suits. Dedicated relationship manager for ensuring unrivalled level of service. Offering information and assistance with expert advice by dedicated relationship managers. Ensuring less time consumption for banking services. Separate Priority Suites for providing personalized banking services and transactions with maximum confidentiality. Commission-free Foreign Currency endorsement and issuance of Traveler’s Cheques. Access to the VIP lounge (Balaka Business class lounge) of Dhaka Sheraton Hotel at Zia International Airport (including immediate family members accompanying) irrespective of the airlines or the class the customer is flying. A 20% discount on food and soft beverages at Balaka restaurant (opposite to the Balaka Business class lounge). Priority Suites in Dhanmondi, Gulshan, and Uttara in Dhaka and Nasirabad in Chittagong. Swifter service in clearing cheques and in-house cheques transfers. Issuance of personalized Priority Chequebook – Free. Debit card replacement charge – Free. 25% Discounts in Locker charges. Full waivers on issuance of Bank certificates – Balance Confirmation Certificate, Certificate of Interest, Solvency Certificate) in Priority Banking letterheads. Duplicate statement (current & previous year) – Free. Ability and flexibility to conduct banking transaction over phone through Call Centre. All you have to do is maintain a minimum balance of BDT 3.5 Millions in your personal account(s) and sign up as a Priority customer. Waiver, discounts, special rates etc. The SWOT analysis comprises of the organization’s internal strength and weaknesses and external opportunities and threats. SWOT analysis gives an organization an insight of what they can do in future and how they can compete with their existing competitors. This analysis is a tool for auditing an organization and its environment. (1)Market leader: SCB’s Banking Experience for more than 50 years in Bangladesh provides SCB the strength of being the market leader in the foreign banking sector. This strength of SCB is to a great extent unmatched by any other multinational bank in Bangladesh, as the long term success of a bank heavily depends on the reputation that has been built over the years while dealing with very sensitive commodity like money. (2)Favorable Brand Image: SCB’s continuous and sound profitability track record created a good brand image among at all level. In their history they never faced any big disaster which effected customer interest. (3)First bank in Bangladesh to issue money link: SCB is the first bank in Bangladesh to issue Money link (ATM) card. As the market leader, they showed the most substantial corporate strength among the foreign banks by grabbing the opportunity that exists in the market. (4)Devoted HR: SCB has a bulk of qualified, experienced and dedicated human resources. (5)Wide customer base: Among the foreign banks, SCB is the only one which has been able to capture a wide customer base at a very short time through its extensive marketing efforts. (6)24 hour service: SCB is very dedicated to provide the best phone banking services in town, and to provide unmatched and instant 24 hour banking service, it has opened the Call Centre at Lotus Kamal Tower in Nikunjo, Dhaka. (7)Evening banking services: SCB provides evening banking services at some selected branches, which helps the customers a lot. The evening banking service is provided at three branches- the one in Gulshan and the two branches in Dhanmondi. It is open form 6pm to 8 pm in the evening. This reduces the lag and hassle for the customer who has to keep his transactions stopped for 18 hours until the next banking hour arrives. (8)Innovative multiple products: SCB tries to be innovative and creative by coming up with customers, banking problems and solving them. (1)Few branches: SCB has fewer branches than its domestic competitors. For instance SCB has only 18 branches whereas Uttara Bank Limited has 198 branches and 12 regional offices. (3)Inadequate management structure: SCB is more hierarchy-driven compared to other multi-national banks. Despite restructuring, the organization is yet to achieve flat-management structure. (4)Lengthy service procedure: Procedure of availing service from SCB is quit lengthy and costly other then the competitors. It restricts the flexibility of the service at some extent and hampers customer satisfaction. (5)Incompetent ATM: Customers often complain that the ATMs are out of order. (6)Inadequate facility: Some branches of SCB situated in commercial area do not have adequate facility to serve the rush and thus creating dissatisfaction among a major portion of the customer group. (7)Conservative or defensive strategies: Marketing and the promotional strategies of SCB are rather reactive and defensive. And as most of them are designed globally, those fail to attract consumers entirely. (8)Weaker distribution channel: SCB weaker distribution channel then that of other competitors. Whereas other national private bank like The City Bank have branches in most of the district cities. (1)Increased potential customers: The population of Bangladesh is continuously increasing. The country’s growing population is gradually and increasingly learning to adaptation of consumer finance. As the bulk of our population is middle class, different types of products have very large and easily pregnable market. (2)Utilization of idle cash: In today’s economy, substantial amount of savings are remaining idle. Currently foreign direct investment in the country is very low. Banks can avail this opportunity to provide loans to the local entrepreneurs to set up businesses and utilize the idle cash. (3)Huge consumer base: Bangladesh has a huge consumer base for maintaining several accounts. So SCB has the opportunity to keep these customers by reducing its current fees and charges and positioning attractively in middle class segment. (4)New businesses with existing customers: In addition to making new business with new customers, SCB also has the opportunity to make new businesses with existing customers as well. SCB can offer lower interest rates, can lower the minimum balances eligible for interest. This way the bank can attract a lot of the old customers who are availing services of other banks. (5)Growth in export, import and remittance: Growth in export, import and remittance will definitely increase the business opportunity for SCB. (6)Emergence of techno based products: Emergence of techno based product and services will create more space to provide quality service, as they are expert in this area. (7)Growing higher class consumer group: Newly targeted market for SCB is the upper higher class sector, which is growing recently. Again this sector is more aware about financial services and understands the significance better. (1)Increased competition: Increased competition by other foreign banks one of the threats to SCB. At present HSBC and CITI Corp are posing significant threats to SCB regarding retail and business banking respectively. Furthermore, the new comers in private sector Prime Bank, Dutch Bangla Bank, EXIM Bank, BRAC Bank, Southeast Bank, Mercantile Bank, Social Investment Bank, Islami Bank and Bank Asia are also coming up with very competitive products. (2)Govt. instruction towards foreign banks: Increased provisioning requirement and increased paid up capital maintenance requirement have proved to be the increased threats toward the private banks. (3)Customer being interest conscious: Customers now days are very interest conscious and are not very effortlessly accepting the reasons for increased interest and other charges. (4)Market pressure for lowering of lending rate: Price-cutting due to the unfair and hostile competition, i.e., market pressure for lowering of lending rate. (5)More effective advertisement of competitors: Competitors are giving more frequent and effective advertisement than Mutual Trust Bank. (6)Fluctuation of exchange rate: Deep and frequent exchange rate fluctuation negatively impacting on import and export business of all the clients, which in turn effects SCB. (7)Political instability of the country: Political acrimony and frequent strike and pervasive nature of corruption are big threats for SCB. Also the legal system of the country is very inefficient and unstructured, which is a big threat for SCB to operate smoothly. As the market is faced by lots of banks, not only local but also foreign banks, this has become almost saturated. As a result the competition among the existing player is very high. That means the rivalry is high. Interest rate and other charges of banks influence customers intensely in deciding from whom they will take the service or not. And as the interest rates and other charges decide the ultimate profitability of the banks this increases rivalry among the industry. Growing economic activities, large population, rapid urbanization, and migration of rural people to the urban area, peoples increasing affordability, changes in higher class people testes & choice, availability of consumer lone & lease finance facility and, people’s higher consumption and spending tendency have increased the rivalry among the companies. Product differentiation is not that high, rather it could be said that the differentiation is moderate somewhat in this industry. More or less the same types of products are offered by different banks. And as the differentiation is low, rivalry in the industry is high. Exit cost is not high in this industry. Banks have to reduce their functions first and also have to pay huge compensation to its employees. So, competitors try to avoid exiting the industry which increases the rivalry among the players. Consumers of banking industry mostly comprise of individual buyers. But individual customers have no bargaining power as their individual deposit is not that significant for the banks. But scenario is different for the corporate clients. As, some of the corporate clients have large share of the corporate deposit they ask for special rates from the banks and banks try to acquire those few corporate as they prove to be profitable for the bank. It can be said that the pressure from corporate clients is present but that does not strengths buyers bargaining power. So, overall the bargaining power is not present in the industry and thus increases the attractiveness of the industry. As it is told earlier, there are not much substitute products available in the industry. Same products are being sold at different names through different banks. As a result bargaining power of buyers is low. When switching cost of buyer is high, bargain power of buyer is low. But sometimes it depends on brand-to-brand and company-to-company. For example- if a customer wants to switch from SCB, then its switching cost is high. On the other hand if it is any local bank, then the switching cost is low. Thus the switching cost of buyer is low to moderate. There are thousands of depositors in this industry. As there is an increased population, rapid urbanization so the suppliers of the resources are also increasing. As a result the bargaining power of supplier is not that high. The switching cost of suppliers is moderate, as they have to compromise some of their money or resource when they switch from one bank to another. Establishment of banks needs huge investment and it is impossible to achieve economies of scale overnight. It takes a considerable period to acquire a bunch of customers, which will ensure economies of scale (lower fixed cost per product). So economies of scale play as barrier to new entrant from easily entering the industry which lowers the threat of new entrants. Consumers of this industry are not that much brand loyal. It has been observed that, consumers switch to different banks due to flexibility in the service offered by various banks. Thus brand preference of the consumer does not create any entry barriers for new comers. The capital requirement for entering in the banking industry is quite high. Again in recent year the present government has given a ceiling of initial capital investment capital of BDT 100 crores, which restricts new banks to enter the market. Thus, capital is creating entry barriers for the new players. Branches of the banks play the role of distribution channel. Bank, which has more branches in convenient places, are permitted with more access to the customer. So for banks acquiring more outlets are important. However, this is difficult for a new entrant to establish at first place. For So difficulty in accessing the distribution channel creates an entry barrier for the new entrants. All the banks are closely monitored by the Bangladesh Bank and they are bound to follow the guideline made by them. In regular interval Bangladesh modify their guidelines and this brings new challenge for the banks. For example, newest addition to the guideline is banks have to closely monitor the transactions of all the customers and have to question abnormal transaction. This rule is made due to control money laundering but this is creating customer dissatisfaction at great level for the banks. I recent days Bangladesh bank planned to increase the lending rate which will decrease the tendency of taking loans, which will indeed cause harm to the business of all the banks. Though, huge issuance of license to large amount of private banks to operate made the life of new entrant easier to enter the market in the last decade has been restricted. Thus, government policies are acting as entry barriers for the new entrants. In recent days, some financial institutions like leasing companies are coming up with similar services that normally commercial banks offer. These services can act as substitute of banking services. But still the presence is not that strong and numbers of such financial institutions are very few. Thus absence of pressure from substitute product increases the attractiveness of banking industry. In terms of cost of fund and so the price factors, the banking sector is better placed than the lease sector. About 15% of the deposits of the banking sector is reported to be demand deposits which are interest free while 35% constitute low cost saving deposits. As a result it could be said that the threat of substitute product is low. Analyzing the entire situations, it can be said that the industry is moderately attractive for the existing players. It is very true that most of the customers do not hesitate to term Mutual Trust Bank better than other banks. Mutual Trust Bank has been able to earn lots of customers and as I have done the study on priority account holder’s satisfaction level, I must say lots of account holders. But only getting the customers will not pay to them. Now, it is the hard time that SCB should ring a bell to its own aim, which was to give the best service to its clients. As per Dhanmondi Branch, it has been seen that although the Priority Banking division has started only a few years back, it is trying its best to satisfy their customers on top of things. SCB Dhanmondi Branch has much more potential to explore the existing situation. The main customers of this branch hold a strong background, which is a positive obsession for this branch. However, from this report it came to know that there are many factors to which customers are very much dissatisfied. In order to confiscate, this dissatisfaction it would be better if this branch gets more spirited in every aspect in their service. It should be considered that the customers have very few choices of banks with which they can actually compare the good priority service. However, the local banks have recently focused their attention to customer service, satisfaction and credit card service. Moreover, there are a good number of private banks that are in the competition. Therefore, it is better for Standard Chartered not to let the situation be worse, and from now on SCB should emphasize on serving customers more effectively and efficiently. It is evident that SCB Gulshan Branch– Priority division has failed to serve their customers appropriately in some areas. In order to improve in these areas, I have tried to make some recommendations for SCB Gulshan Branch. Increase interest rates: The foremost demand of the majority of customers was to Interest the interest rates. Some of the local banks such as Brac Bank, Dhaka Bank, planned to offer their customers similar kind of product with a higher interest rate. SCB should take precautionary measures to keep their products viable to customers both new and old. Therefore, the suggestion to SCB would be to set charges consistent with competitor’s charges pattern. Lessen monthly and other related charges: Reducing existing charges can successfully attract a huge number of customers to SCB. If charges are made considerable, SCB can capture a big portion of middle class society who can be proved to be better customer than any other class of the society. SCB should lower their charges immediately to prevent the loss of customers. Make hassle-free procedure: People of our country usually do not want to step in those systems that are tricky and multifaceted. Moreover, it has been seen that customers of SCB mostly complain about their procedure. To hold on to a large number of customers SCB should understand that they have to make their service availing procedures, like to get a card; to seal it and other others related procedures, easier and tranquil. Raise the number of qualified customers Another service, where SCB should turn their eyes on is the number of qualified customers available who accept their services. In that case SCB may arrange seminars with the customers and make them convince about their payment system and benefits. Increase RM to avoid long queue: Dhanmondi Branch has only one RM. And sometimes it becomes hard for him to control too many customers at a time. Most of the time the customer pressure is not hat high. Nevertheless, at times, like in any festival it turns out to be impossible for the RM to handle too many customers. And that was also the complaints of many respondents. Therefore, it is hard time that Gulshan Branch increases the number of their RM. Educate customers more about Priority products: from the analysis, it came to know that many customers do not understand many terms and procedures of products although they are using them. So, in this case SCB as a whole or if it not possible than it would a idea to only Gulshan branch to arrange a seminar for the account holders so that they become more educated and in that way SCB can grab more customers. Train the RMs more: Recruit or train the existing workforce. SCB should recruit more qualified, skilled, and smarter salespeople, who will be able to persuade eligible customers to have a banking relationship with SCB. The present sales force does not seem to lack the quality, but still, to keep pace with the increased competition, it is advised to SCB to raise the skill level of the RMs. In that case employee trainings and workshops should be administered in order to give them knowledge and professionalism in customer interactions. Along with that, SCB senior officials should be more cooperative to their subordinates and arrange for workshops to keep them motivated in their work. Reduce system error: As I have worked in the SCB Gulshan Branch, so I faced some problem in the computer. Therefore, I know that customer handling gets late because of the system error. It would be my suggestion to SCB that they try to solve this problem as soon as possible, so that there are no afterward in providing service to the customers. Provide service on time: in the data analysis, it is seen that RM tells exactly when services will be performed according to the respondents. However, this totally contradicts with the actual scenario. Most of the customers said that, services are not performed as when it is being told. RMs should be more trained concerning the actual processing and capturing time of the head office, so that there is no communication gap between them and the customers. Raise the standard of telephone call responses: Customers are very dissatisfied with the telephone accessibility. Limited phone line and service time with uncertain access, a long time waiting time to get the service is time consuming and costly to the customers. So in order to improve this situation phone line should be increased with the increase of other resources. Again, it has been complained that RM in the branch do not attend and answer the queries with full attention. Here, RMs should be more trained as per how to satisfy the customers over phone. Provide special attention and Priority account holders: Every customer wants their problem to be handled with special care, they want individual attention. People choose a private bank with the expectation that they will be treated far above the ground. So, customers will not be satisfied only getting their problems solved. RMs should understand that account holders are the people who get cards having total faith in the bank. So, only recognizing and solving the problem will not be enough, RMs should be sympathetic with the account holders. Only then, it will pay to the bank and ultimately increase the bank’s profit. Build loyal relationship with priority customers: Priority customers are the people who earn the bank interest and so profit. Therefore, the bank should focus more on existing card holders in order to build strong and loyal relationship with them as most satisfied customers recommends the bank to friends and relatives. Thus, the power of relationship will promote positive word of mouth communication and will attract new customers. Explore the branch situation: The management of Gulshan Branch can consider doing an extensive marketing research on its own to understand the priority account holder’s perception and expectation. This is vital for them to deliver expected service quality and thus to close the customer gap they have been facing for so long. As customer expectations and satisfaction are not static figures, regular research at sufficient intervals should be conducted. Quality Assessment Week: SCB should closely monitor the quality of the service and continuously modify it. By doing this, they may provide prompt solution of those problems to ease the requirements of the customer. Additional facility to loyal priority accounts holders: Priority customers those holders who are maintaining the threshold of the accounts and also fulfilling all the other necessary procedures for loans should be given privileges, such as providing them lower interest rates regarding the loans. Also, sending them small gifts and flowers on their special occasions such as anniversaries and birthdays. They should also invite them to various programs organized SCB, such as The SCB NIGHT to make them feel that they are very special and important to the organization .This will make the customers feel that SCB value their asset, time and the relationship; which make the customers more loyal to the bank. Promotion of the priority products and services: Last but not the least, it has been seen that many customers were neutral about many features of priority banking. Therefore, the bank should concentrate more on promotion of various features of the product. Priority account holders were uncertain about many features. These promotions must provide details regarding the features of the product and the procedure to avail it. These plans must also provide information regarding the usefulness of the features and the requirements of the product to be availed by the customer. The RM should also aware about the promotions that, what actually went there, what offers are given and so forth. They should be fully prepared to answer all sorts of queries of the customers, which will help the branch to satisfy the customers completely.